Independent contractors, temporary workers and other workers employed by a job placement agency have increased from around 10 percent of the U.S. workforce in 2005 to around 40 percent today. It is necessary for businesses to adapt with the changes and instill stronger screening processes. A bad hire can negatively impact your company’s reputation and brand. As news continues to spread faster, it becomes increasingly important to protect your company, image, clients and employees. Protecting your brand name is necessary to continue to grow. Screening job candidates will help to ensure better hires, less turnover and higher quality candidates. You can take the guesswork out of which candidate you should trust when you are presented with a report on their background, licensure, education, etc. As we look toward the future and methods companies will likely adapt to better protect themselves, rescreening is at the top of the list. Creating a company policy to have employees rescreened on a regular basis will help minimize issues with loss of licensures and recent criminal acts. 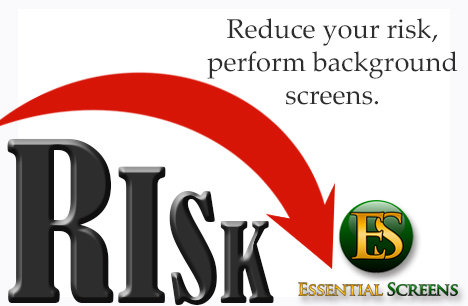 Expanding your screenings and rescreenings to contract or contingent workers will also be vital. If you have any questions on how to better protect your company, clients and employees, contact one of our experienced consultants today.